Last week I posted a think-piece that refuted some widely-held but disparate opinions on the fundamental reasons for price drops in the world’s major commodity markets since mid-July (Mercenary Musing, November 17, 2014). 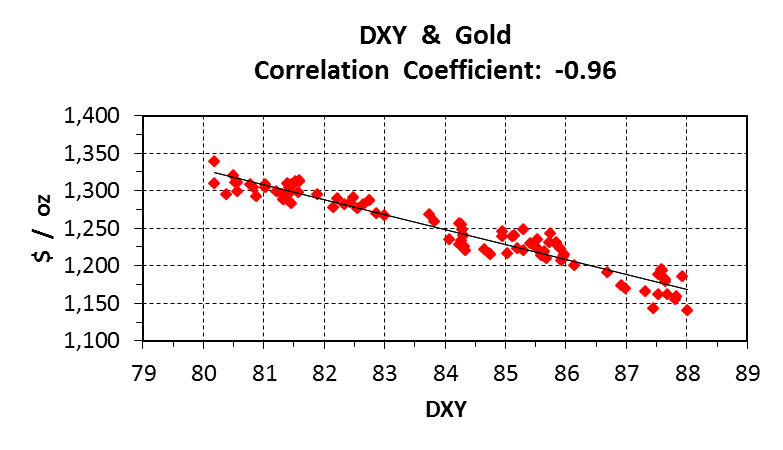 My work used a basic statistical tool, the correlation coefficient, to provide evidence that the downticks in gold, copper, and oil can be largely attributed to the strength of the US dollar. 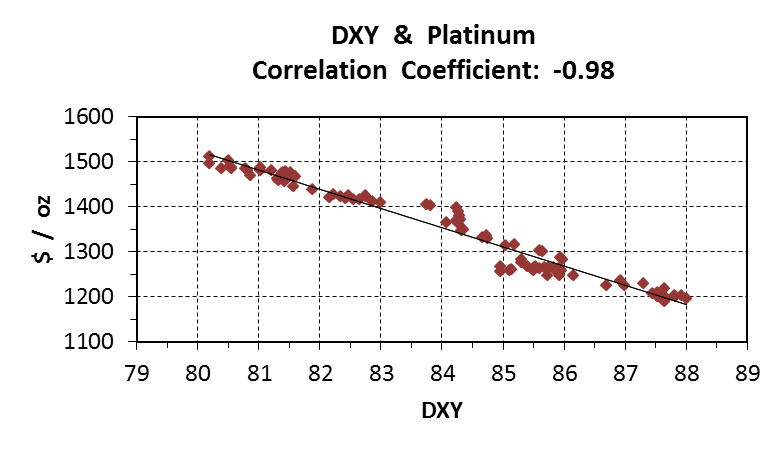 Today, I provide evidence that the short-term prices for the other precious metals of import, silver, platinum, and palladium, are also very highly correlated in inverse fashion with the US dollar index. 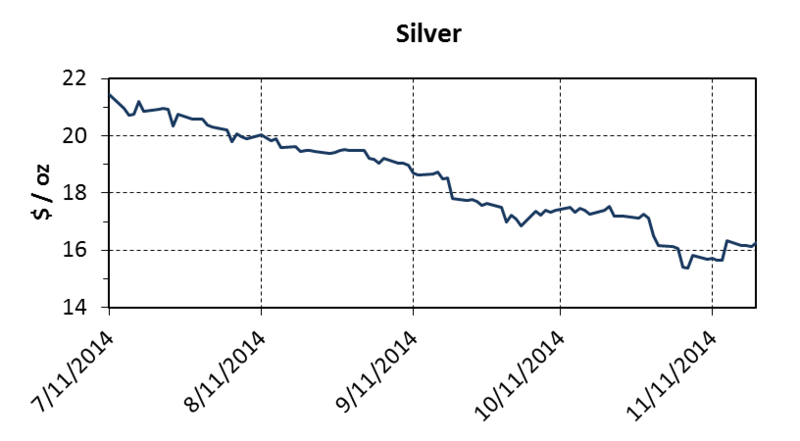 These charts illustrate US dollar strength and nearly constant decline in the prices of gold, silver, and platinum since multi-month highs were reached in mid-July. 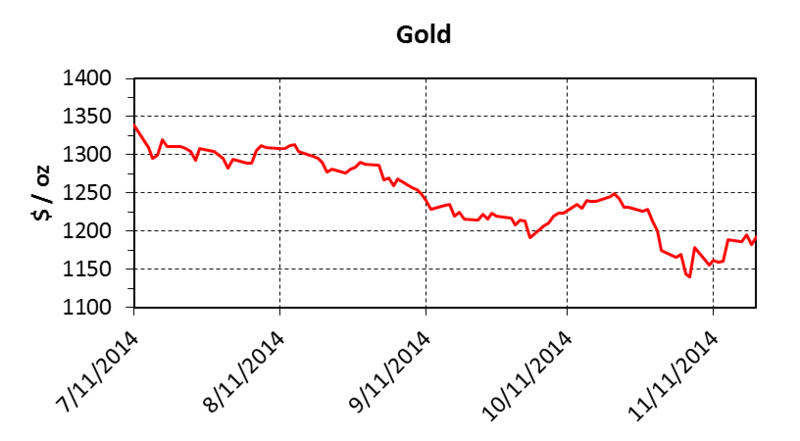 Also note that with a flat dollar over the past 10 trading days, gold and silver have rebounded indicating that an oversold situation existed. 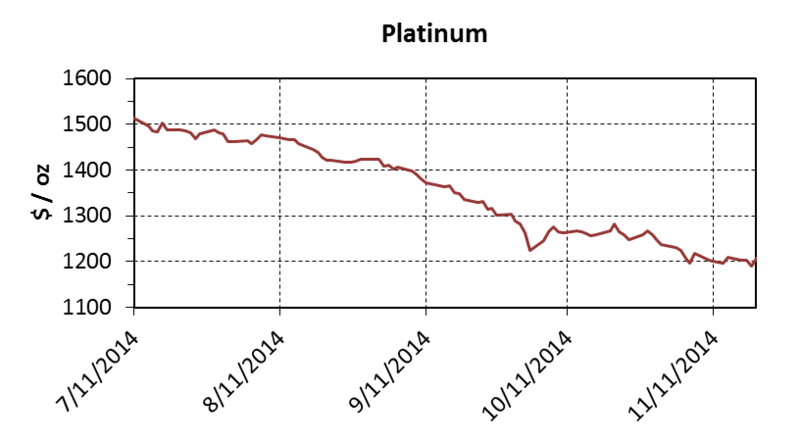 Meanwhile, the platinum price has stabilized. 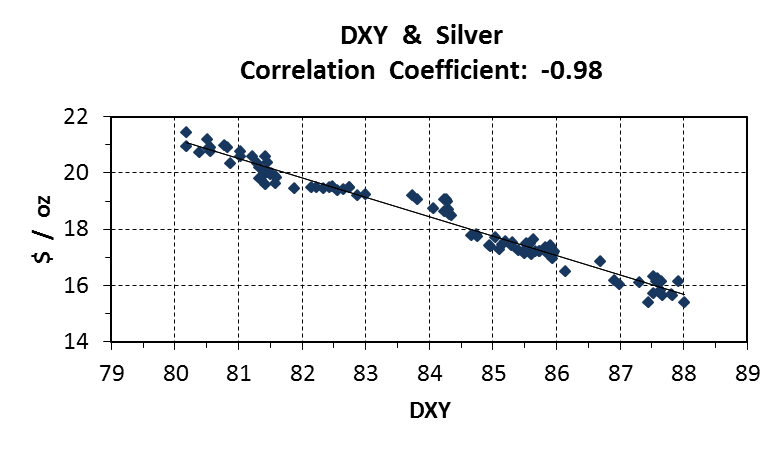 Considering that -1 indicates perfect negative correlation, the coefficients of -0.96 for gold and -0.98 for silver and platinum are astounding. 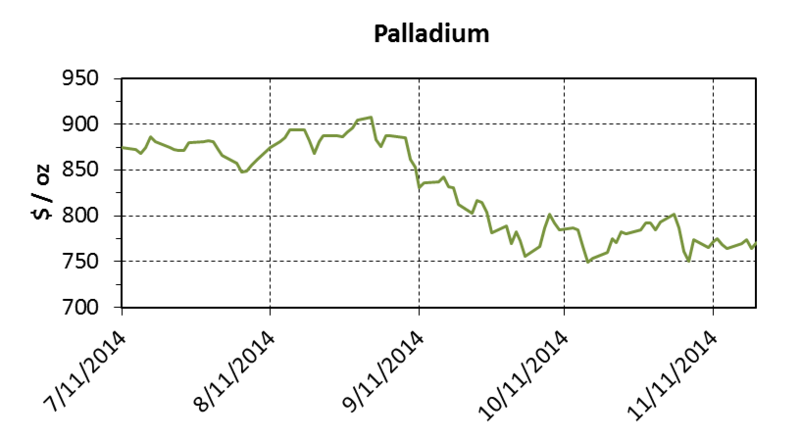 Even the less correlative palladium at -0.88 is still very high. Palladium is arguably the most “industrial” of the precious metals, with about two-thirds of annual demand for catalytic converters in gasoline-powered automobiles. It is also used as a catalyst in the chemical and petroleum industries, in dentistry, and for jewelry, especially in China as a cheaper alternative to platinum. A minor amount is also minted for investment-grade coins and bars. 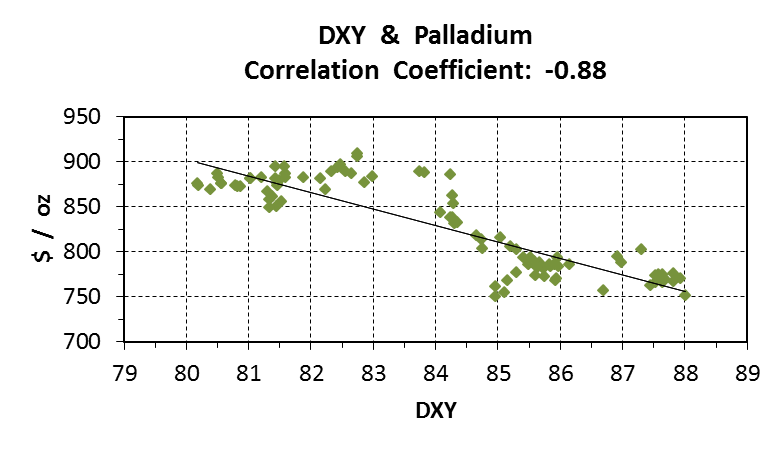 I opine that palladium’s correlation with DXY has been countered by currently robust auto markets in the United States and China. My previous missive documented very high inverse correlations between the dollar index and the three major internationally-trade commodities: gold, copper, and oil. I received positive comments from several readers including Frances Horodelski, who many will recognize as the morning anchor with Canada’s Business News Network (BNN). Frances and another reader both noted that correlation does not imply causation. I am fully aware of that, but neglected to mention it in last week’s musing; my bad. 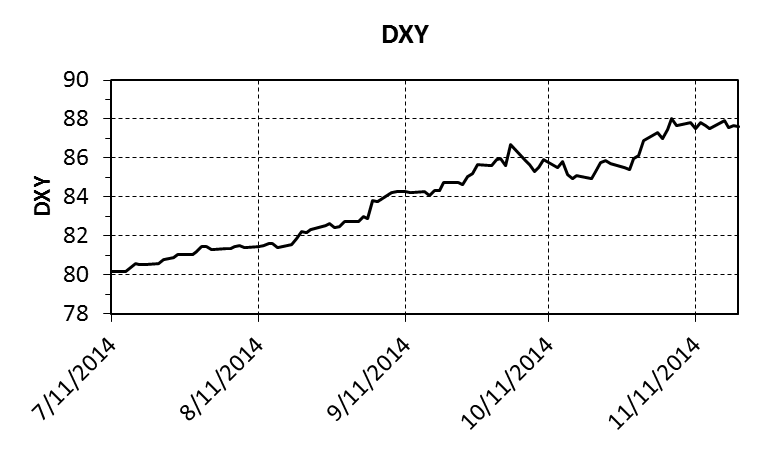 That said, the high negative correlations of the US dollar index with all the precious metals, North America’s oil benchmark, and Dr. Copper leave little doubt in my mind that the strong dollar has been trumping all other cards for the past 4+ months. However, it now appears that the hard commodities are oversold and a rally may be forthcoming. I intend to explore this idea next week with another musing that will focus on the price of gold. Copyright © 2014 Mercenary Geologist.com, LLC. All Rights Reserved.